Port Angeles City Hall is located at 321 East 5th Street, Port Angeles, WA 98362; phone: 360-457-0411. Photo: Joseph Paris House, ca. 1920, 101 East Fifth Street, Port Angeles, WA. Listed on the National Register of Historic Places in 1987. Photographed by user:Jon Roanhaus (own work), 2014, [cc-by-3.0 (creativecommons.org/licenses/by/3.0)], via Wikimedia Commons, accessed May, 2015. The City of Port Angeles has long been the primary urban center of the North Olympic Peninsula. The earliest residents of the area were Native Americans such as the Klallam ("Strong People") and Makah Indian tribes, who were sustained by the region's abundant natural resources. These same natural resources - the naturally protected deep-water harbor, abundant coniferous forests, prolific wildlife and marine resources, and an overall natural beauty also attracted the first non-natives to the area and continue today to encourage visitors and new residents alike from all walks of life. Known variously as "Old Dungeness," "False Dungeness," "Cherbourg," and "Port Angeles," settlement was intermittent and sporadic throughout the early history of the City. In 1862 (due largely to the efforts of one man: Victor Smith, the "Father of Port Angeles"), President Abraham Lincoln signed an executive order setting aside 3,520 acres of land on the site as a U.S. Government Lighthouse and Military Reservation. Soon after, the original townsite layout was platted by the US Army Corp of Engineers, and the Townsite of Port Angeles has endured to this day. Patterned after the plan of Cincinnati, Ohio (substituting the Harbor for the Ohio River), the streets are arranged and named the same: Front, First, Second, etc. and at right angles to these are Tumwater, Cedar, Pine, Valley, Cherry, Oak, Laurel, Vine, and Race Street. While the City has benefited greatly from that original planning with its grid-pattern street layout, various challenges were also created such as utility service provision and circulatory problems, due to the topography of the land. Seven different streams, with associated ravines, travel through the community running south-to-north as they wend their way to the Strait of Juan de Fuca. They are: Dry Creek, Tumwater Creek, Valley Creek, Peabody Creek, Ennis/White's Creek, Lee's Creek, and Morse Creek. Despite such early planning, major settlement did not take place within the City until 1887 with the founding of the Puget Sound Cooperative Colony. A social experiment in communal living the Colony contributed greatly to the expansion of Port Angeles. Although short-lived, this settlement near the mouth of Ennis Creek built a sawmill, lath-mill, and shipyard; constructed a 58-foot propeller-driven schooner, "The Angeles;" started the first newspaper in town (The Model Commonwealth); and built the first schoolhouse, office building, and a City Opera House, in addition to founding four different churches in Port Angeles. The Colony was largely disbanded by 1889 due to internal disputes, but many of the colonists stayed and blended with the rest of the thriving community. By 1890, the City population had soared to over 3,000 people, and the Government Reserve established 28 years earlier had become a bottleneck to progress, completely restricting further development of the City since it could not legally be homesteaded. The result was a "land rush" onto the federal property as citizens took matters into their own hands as "Reserve Jumpers" that 4th of July, moving en masse onto the reserve, platting lots, and establishing homesteads. Eventually, forced to recognize this matter officially, Congress conceded ownership to the squatters and opened the Reserve for sale to the public. The year 1890 was also notable as the year Port Angeles was officially incorporated as a City in the newly established State of Washington, and that same year it also became the County Seat of Clallam County. Thereafter, the City grew more slowly and developed much, as did other small towns in the Pacific Northwest. Gone were the early pretensions of becoming a great seaport or Second National City patterned after Washington, D.C.
Logging and timber have long been important industries, and in 1912 Port Angeles was home to the world's largest sawmill. In 1920, a large pulp and paper mill was built by Washington Pulp and Paper Company. Purchased a few years later and operated by Crown Zellerbach for over 60 years, the mill is now owned by Nippon Paper Mill. The City experienced sporadic growth until the linking of Port Angeles with the transcontinental railroad in 1914 brought increased prosperity. As rail transport increased and sea travel waned, Port Angeles surpassed Port Townsend as the major center for trade and commerce on the Olympic Peninsula. Sustained largely by marine trades and the lumber and fishing industries, Port Angeles became a classic American small town and the center of urban life on the North Olympic Peninsula. In 1922, the Port of Port Angeles was formed. The natural deep-water harbor has always attracted shipping and both commercial and sports fishing. The Port operates a marina, boat haven, and international airport. The first Coast Guard air station on the Pacific Coast was established at Ediz Hook on June 1, 1935. It is the oldest United States Coast Guard Station in the country. The piece of land occupied by the Coast Guard Station is the one remaining part of the military reservation that once included all of what is now Port Angeles. The station officially became Coast Guard Group Port Angeles in September of 1944 and received its first helicopter in 1946. By far, the largest civic project was the regrading of the downtown streets, which occurred in 1914. The Olympic Power Company was formed in 1911 to construct the Lower Elwha Dam. The county Courthouse was built on Lincoln St. in 1915. A new fire station was built in 1931. A new Police station and jail was built in 1954 and a new city hall in 1987. In 1953 Port Angeles received the All American City Award. 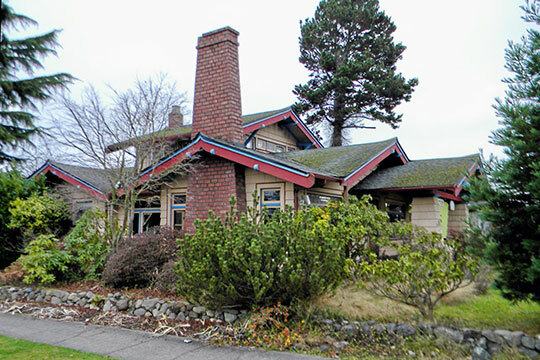 City of Port Angeles, Department of Community and Economic Development, The Comprehensive Plan, 2010, www.cityofpa.us, accessed May, 2015.